The Royale. Photo by Helen Murray. Marco Ramirez's compelling semi-biographical play The Royale places the audience around a boxing ring then thrusts us deep into a sweaty, dangerous quagmire as we watch tensions rise in the lead up to the fight of the century. 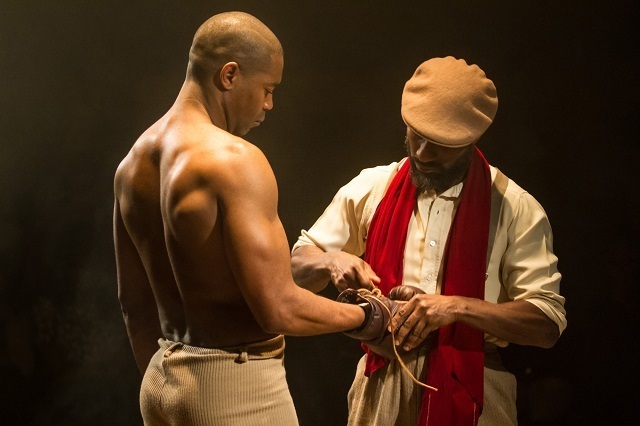 The play is set in 1905 and loosely based on the real life story of heavyweight champion John "Jack" Johnson. It starts with Jay Jackson (Nicholas Pinnock), who will become the first black heavyweight champion in the US, fighting in a racially-segregated boxing world where black and white don't compete with each other. Jay, nicknamed "The Sport", fights for his place in history against these bigoted rules, surrounded by his coach Wynton (Clint Dyer), sparring partner Fish (Gershwin Eustache Jnr) and manager Max (Ewan Stewart). There is no actual boxing in the play — the fights are brilliantly choreographed in an abstract way allowing Jay to emotionally reveal himself to the audience. A visceral soundscape is provided by the cast stamping, stomping and clapping, all of which helps keep the audience locked into the fast-moving narrative. The ensemble is tight and succeeds in creating a world in which no one is safe, as Jay prepares for his most important fight. And when Jay's sister Nina (France's Ashman) forewarns of the consequences this fight will have there is a beautiful intensity, the abstract style continuing as she finds herself in the ring with her brother. It's these scenes which wind the audience, especially as Jay battles with the possible repercussions of his desire to fight. In The Royale, the true power comes from the fact that whatever happens in the ring, it’s not going to be a simple win or lose situation. The Royale runs at The Bush Theatre until 18 April. Tickets £15-20. Londonist saw this play on a complimentary ticket.